It has been suggested that Selenium pollution be merged into this article. (Discuss) Proposed since February 2019. Selenium is a chemical element with symbol Se and atomic number 34. It is a nonmetal (more rarely considered a metalloid) with properties that are intermediate between the elements above and below in the periodic table, sulfur and tellurium, and also has similarities to arsenic. It rarely occurs in its elemental state or as pure ore compounds in the Earth's crust. Selenium (from Ancient Greek σελήνη (selḗnē) "Moon") was discovered in 1817 by Jöns Jacob Berzelius, who noted the similarity of the new element to the previously discovered tellurium (named for the Earth). Selenium is found in metal sulfide ores, where it partially replaces the sulfur. Commercially, selenium is produced as a byproduct in the refining of these ores, most often during production. Minerals that are pure selenide or selenate compounds are known but rare. The chief commercial uses for selenium today are glassmaking and pigments. Selenium is a semiconductor and is used in photocells. Applications in electronics, once important, have been mostly replaced with silicon semiconductor devices. Selenium is still used in a few types of DC power surge protectors and one type of fluorescent quantum dot. Selenium forms several allotropes that interconvert with temperature changes, depending somewhat on the rate of temperature change. When prepared in chemical reactions, selenium is usually an amorphous, brick-red powder. When rapidly melted, it forms the black, vitreous form, usually sold commercially as beads. The structure of black selenium is irregular and complex and consists of polymeric rings with up to 1000 atoms per ring. Black Se is a brittle, lustrous solid that is slightly soluble in CS2. Upon heating, it softens at 50 °C and converts to gray selenium at 180 °C; the transformation temperature is reduced by presence of halogens and amines. The red α, β, and γ forms are produced from solutions of black selenium by varying the evaporation rate of the solvent (usually CS2). They all have relatively low, monoclinic crystal symmetries and contain nearly identical puckered Se8 rings with different arrangements, as in sulfur. The packing is most dense in the α form. In the Se8 rings, the Se-Se distance is 233.5 pm and Se-Se-Se angle is 105.7°. Other selenium allotropes may contain Se6 or Se7 rings. The most stable and dense form of selenium is gray and has a hexagonal crystal lattice consisting of helical polymeric chains, where the Se-Se distance is 237.3 pm and Se-Se-Se angle is 130.1°. The minimum distance between chains is 343.6 pm. Gray Se is formed by mild heating of other allotropes, by slow cooling of molten Se, or by condensing Se vapor just below the melting point. Whereas other Se forms are insulators, gray Se is a semiconductor showing appreciable photoconductivity. Unlike the other allotropes, it is insoluble in CS2. It resists oxidation by air and is not attacked by nonoxidizing acids. With strong reducing agents, it forms polyselenides. Selenium does not exhibit the changes in viscosity that sulfur undergoes when gradually heated. Owing to its use as a photoconductor in flat-panel x-ray detectors (see below), the optical properties of amorphous selenium (α-Se) thin films have been the subject of intense research. Selenium has seven naturally occurring isotopes. Five of these, 74Se, 76Se, 77Se, 78Se, 80Se, are stable, with 80Se being the most abundant (49.6% natural abundance). Also naturally occurring is the long-lived primordial radionuclide 82Se, with a half-life of 9.2×1019 years. 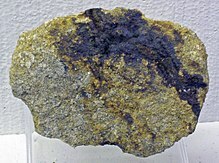 The non-primordial radioisotope 79Se also occurs in minute quantities in uranium ores as a product of nuclear fission. Selenium also has numerous unstable synthetic isotopes ranging from 64Se to 95Se; the most stable are 75Se with a half-life of 119.78 days and 72Se with a half-life of 8.4 days. Isotopes lighter than the stable isotopes primarily undergo beta plus decay to isotopes of arsenic, and isotopes heavier than the stable isotopes undergo beta minus decay to isotopes of bromine, with some minor neutron emission branches in the heaviest known isotopes. Selenium compounds commonly exist in the oxidation states −2, +2, +4, and +6. Selenium trioxide is produced in the laboratory by the reaction of anhydrous potassium selenate (K2SeO4) and sulfur trioxide (SO3). Salts of selenous acid are called selenites. These include silver selenite (Ag2SeO3) and sodium selenite (Na2SeO3). Selenium disulfide consists of 8-membered rings. It has an approximate composition of SeS2, with individual rings varying in composition, such as Se4S4 and Se2S6. Selenium disulfide has been used in shampoo as an antidandruff agent, an inhibitor in polymer chemistry, a glass dye, and a reducing agent in fireworks. Hot, concentrated selenic acid can react with gold to form gold(III) selenate. In comparison with its sulfur counterpart (sulfur hexafluoride), selenium hexafluoride (SeF6) is more reactive and is a toxic pulmonary irritant. Some of the selenium oxyhalides, such as selenium oxyfluoride (SeOF2) and selenium oxychloride (SeOCl2) have been used as specialty solvents. n, which exist as chains. Selenium, especially in the II oxidation state, forms stable bonds to carbon, which are structurally analogous to the corresponding organosulfur compounds. Especially common are selenides (R2Se, analogues of thioethers), diselenides (R2Se2, analogues of disulfides), and selenols (RSeH, analogues of thiols). Representatives of selenides, diselenides, and selenols include respectively selenomethionine, diphenyldiselenide, and benzeneselenol. The sulfoxide in sulfur chemistry is represented in selenium chemistry by the selenoxides (formula RSe(O)R), which are intermediates in organic synthesis, as illustrated by the selenoxide elimination reaction. Consistent with trends indicated by the double bond rule, selenoketones, R(C=Se)R, and selenaldehydes, R(C=Se)H, are rarely observed. Selenium (Greek σελήνη selene meaning "Moon") was discovered in 1817 by Jöns Jakob Berzelius and Johan Gottlieb Gahn. Both chemists owned a chemistry plant near Gripsholm, Sweden, producing sulfuric acid by the lead chamber process. The pyrite from the Falun mine created a red precipitate in the lead chambers which was presumed to be an arsenic compound, so the pyrite's use to make acid was discontinued. Berzelius and Gahn wanted to use the pyrite and they also observed that the red precipitate gave off a smell like horseradish when burned. This smell was not typical of arsenic, but a similar odor was known from tellurium compounds. Hence, Berzelius's first letter to Alexander Marcet stated that this was a tellurium compound. However, the lack of tellurium compounds in the Falun mine minerals eventually led Berzelius to reanalyze the red precipitate, and in 1818 he wrote a second letter to Marcet describing a newly found element similar to sulfur and tellurium. Because of its similarity to tellurium, named for the Earth, Berzelius named the new element after the Moon. In 1873, Willoughby Smith found that the electrical resistance of grey selenium was dependent on the ambient light. This led to its use as a cell for sensing light. The first commercial products using selenium were developed by Werner Siemens in the mid-1870s. The selenium cell was used in the photophone developed by Alexander Graham Bell in 1879. Selenium transmits an electric current proportional to the amount of light falling on its surface. This phenomenon was used in the design of light meters and similar devices. Selenium's semiconductor properties found numerous other applications in electronics. The development of selenium rectifiers began during the early 1930s, and these replaced copper oxide rectifiers because they were more efficient. These lasted in commercial applications until the 1970s, following which they were replaced with less expensive and even more efficient silicon rectifiers. Selenium came to medical notice later because of its toxicity to industrial workers. Selenium was also recognized as an important veterinary toxin, which is seen in animals that have eaten high-selenium plants. In 1954, the first hints of specific biological functions of selenium were discovered in microorganisms by biochemist, Jane Pinsent. It was discovered to be essential for mammalian life in 1957. In the 1970s, it was shown to be present in two independent sets of enzymes. This was followed by the discovery of selenocysteine in proteins. During the 1980s, selenocysteine was shown to be encoded by the codon UGA. The recoding mechanism was worked out first in bacteria and then in mammals (see SECIS element). Native (i.e., elemental) selenium is a rare mineral, which does not usually form good crystals, but, when it does, they are steep rhombohedra or tiny acicular (hair-like) crystals. Isolation of selenium is often complicated by the presence of other compounds and elements. Selenium occurs naturally in a number of inorganic forms, including selenide, selenate, and selenite, but these minerals are rare. The common mineral selenite is not a selenium mineral, and contains no selenite ion, but is rather a type of gypsum (calcium sulfate hydrate) named like selenium for the moon well before the discovery of selenium. Selenium is most commonly found as an impurity, replacing a small part of the sulfur in sulfide ores of many metals. In living systems, selenium is found in the amino acids selenomethionine, selenocysteine, and methylselenocysteine. In these compounds, selenium plays a role analogous to that of sulfur. Another naturally occurring organoselenium compound is dimethyl selenide. Certain soils are selenium-rich, and selenium can be bioconcentrated by some plants. In soils, selenium most often occurs in soluble forms such as selenate (analogous to sulfate), which are leached into rivers very easily by runoff. Ocean water contains significant amounts of selenium. Anthropogenic sources of selenium include coal burning, and the mining and smelting of sulfide ores. Selenium is most commonly produced from selenide in many sulfide ores, such as those of copper, nickel, or lead. Electrolytic metal refining is particularly productive of selenium as a byproduct, obtained from the anode mud of copper refineries. Another source was the mud from the lead chambers of sulfuric acid plants, a process that is no longer used. Selenium can be refined from these muds by a number of methods. However, most elemental selenium comes as a byproduct of refining copper or producing sulfuric acid. Since its invention, solvent extraction and electrowinning (SX/EW) production of copper produces an increasing share of the worldwide copper supply. This changes the availability of selenium because only a comparably small part of the selenium in the ore is leached with the copper. Industrial production of selenium usually involves the extraction of selenium dioxide from residues obtained during the purification of copper. Common production from the residue then begins by oxidation with sodium carbonate to produce selenium dioxide, which is mixed with water and acidified to form selenous acid (oxidation step). Selenous acid is bubbled with sulfur dioxide (reduction step) to give elemental selenium. About 2,000 tonnes of selenium were produced in 2011 worldwide, mostly in Germany (650 t), Japan (630 t), Belgium (200 t), and Russia (140 t), and the total reserves were estimated at 93,000 tonnes. These data exclude two major producers, the United States and China. A previous sharp increase was observed in 2004 from 4–5 to $27/lb. The price was relatively stable during 2004–2010 at about US$30 per pound (in 100-pound lots) but increased to $65 /lb in 2011. The consumption in 2010 was divided as follows: metallurgy – 30%, glass manufacturing – 30%, agriculture – 10%, chemicals and pigments – 10%, and electronics – 10%. China is the dominant consumer of selenium at 1,500–2,000 tonnes/year. During the electrowinning of manganese, the addition of selenium dioxide decreases the power necessary to operate the electrolysis cells. China is the largest consumer of selenium dioxide for this purpose. For every tonne of manganese, an average 2 kg selenium oxide is used. The largest commercial use of Se, accounting for about 50% of consumption, is for the production of glass. 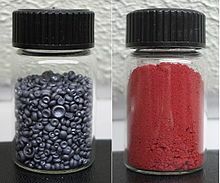 Se compounds confer a red color to glass. This color cancels out the green or yellow tints that arise from iron impurities typical for most glass. For this purpose, various selenite and selenate salts are added. For other applications, a red color may be desired, produced by mixtures of CdSe and CdS. Selenium is used with bismuth in brasses to replace more toxic lead. The regulation of lead in drinking water applications such as in the US with the Safe Drinking Water Act of 1974, made a reduction of lead in brass necessary. The new brass is marketed under the name EnviroBrass. Like lead and sulfur, selenium improves the machinability of steel at concentrations around 0.15%. Selenium produces the same machinability improvement in copper alloys. The lithium–selenium (Li–Se) battery is one of the most promising systems for energy storage in the family of lithium batteries. The Li–Se battery is an alternative to the lithium–sulfur battery, with an advantage of high electrical conductivity. Copper indium gallium selenide is a material used in solar cells. Amorphous selenium (α-Se) thin films have found application as photoconductors in flat panel x-ray detectors. These detectors use amorphous selenium to capture and convert incident x-ray photons directly into electric charge. Selenium rectifiers were first used in 1933. Their use continued into the 1990s. Small amounts of organoselenium compounds have been used to modify the catalysts used for the vulcanization for the production of rubber. The demand for selenium by the electronics industry is declining. Its photovoltaic and photoconductive properties are still useful in photocopying, photocells, light meters and solar cells. Its use as a photoconductor in plain-paper copiers once was a leading application, but in the 1980s, the photoconductor application declined (although it was still a large end-use) as more and more copiers switched to organic photoconductors. Though once widely used, selenium rectifiers have mostly been replaced (or are being replaced) by silicon-based devices. The most notable exception is in power DC surge protection, where the superior energy capabilities of selenium suppressors make them more desirable than metal oxide varistors. Zinc selenide was the first material for blue LEDs, but gallium nitride dominates that market. Cadmium selenide was an important component in quantum dots. Sheets of amorphous selenium convert X-ray images to patterns of charge in xeroradiography and in solid-state, flat-panel X-ray cameras. Ionized selenium (Se+24) is one of the active mediums used in X-ray lasers. Selenium is a catalyst in some chemical reactions, but it is not widely used because of issues with toxicity. In X-ray crystallography, incorporation of one or more selenium atoms in place of sulfur helps with multiple-wavelength anomalous dispersion and single wavelength anomalous dispersion phasing. Selenium is used in the toning of photographic prints, and it is sold as a toner by numerous photographic manufacturers. Selenium intensifies and extends the tonal range of black-and-white photographic images and improves the permanence of prints. 75Se is used as a gamma source in industrial radiography. Selenium is a component of the unusual amino acids selenocysteine and selenomethionine. In humans, selenium is a trace element nutrient that functions as cofactor for reduction of antioxidant enzymes, such as glutathione peroxidases and certain forms of thioredoxin reductase found in animals and some plants (this enzyme occurs in all living organisms, but not all forms of it in plants require selenium). From about three billion years ago, prokaryotic selenoprotein families drive the evolution of selenocysteine, an amino acid. Selenium is incorporated into several prokaryotic selenoprotein families in bacteria, archaea, and eukaryotes as selenocysteine, where selenoprotein peroxiredoxins protect bacterial and eukaryotic cells against oxidative damage. Selenoprotein families of GSH-Px and the deiodinases of eukaryotic cells seem to have a bacterial phylogenetic origin. The selenocysteine-containing form occurs in species as diverse as green algae, diatoms, sea urchins, fish, and chickens. Selenium enzymes are involved in the small reducing molecules glutathione and thioredoxin. One family of selenium-bearing molecules (the glutathione peroxidases) destroys peroxide and repairs damaged peroxidized cell membranes, using glutathione. Another selenium-bearing enzyme in some plants and in animals (thioredoxin reductase) generates reduced thioredoxin, a dithiol that serves as an electron source for peroxidases and also the important reducing enzyme ribonucleotide reductase that makes DNA precursors from RNA precursors. The U.S. Recommended Dietary Allowance (RDA) for teenagers and adults is 55 µg/day. Selenium as a dietary supplement is available in many forms, including multi-vitamins/mineral supplements, which typically contain 55 or 70 µg/serving. Selenium-specific supplements typically contain either 100 or 200 µg/serving. Signs and symptoms of selenosis include a garlic odor on the breath, gastrointestinal disorders, hair loss, sloughing of nails, fatigue, irritability, and neurological damage. Extreme cases of selenosis can exhibit cirrhosis of the liver, pulmonary edema, or death. Elemental selenium and most metallic selenides have relatively low toxicities because of low bioavailability. By contrast, selenates and selenites have an oxidant mode of action similar to that of arsenic trioxide and are very toxic. The chronic toxic dose of selenite for humans is about 2400 to 3000 micrograms of selenium per day. Hydrogen selenide is an extremely toxic, corrosive gas. Selenium also occurs in organic compounds, such as dimethyl selenide, selenomethionine, selenocysteine and methylselenocysteine, all of which have high bioavailability and are toxic in large doses. On 19 April 2009, 21 polo ponies died shortly before a match in the United States Polo Open. Three days later, a pharmacy released a statement explaining that the horses had received an incorrect dose of one of the ingredients used in a vitamin/mineral supplement compound that had been incorrectly prepared by a compounding pharmacy. Analysis of blood levels of inorganic compounds in the supplement indicated the selenium concentrations were ten to fifteen times higher than normal in the blood samples, and 15 to 20 times higher than normal in the liver samples. Selenium was later confirmed to be the toxic factor. Selenium deficiency can occur in patients with severely compromised intestinal function, those undergoing total parenteral nutrition, and in those of advanced age (over 90). Also, people dependent on food grown from selenium-deficient soil are at risk. Although New Zealand soil has low levels of selenium, adverse health effects have not been detected in the residents. Selenium deficiency, defined by low (<60% of normal) selenoenzyme activity levels in brain and endocrine tissues, occurs only when a low selenium level is linked with an additional stress, such as high exposures to mercury or increased oxidant stress from vitamin E deficiency. Selenium interacts with other nutrients, such as iodine and vitamin E. The effect of selenium deficiency on health remains uncertain, particularly in relation to Kashin-Beck disease. Also, selenium interacts with other minerals, such as zinc and copper. High doses of Se supplements in pregnant animals might disturb the Zn:Cu ratio and lead to Zn reduction; in such treatment cases, Zn levels should be monitored. Further studies are needed to confirm these interactions. In the regions (e.g. various regions within North America) where low selenium soil levels lead to low concentrations in the plants, some animal species may be deficient unless selenium is supplemented with diet or injection. Ruminants are particularly susceptible. In general, absorption of dietary selenium is lower in ruminants than other animals, and is lower from forages than from grain. Ruminants grazing certain forages, e.g., some white clover varieties containing cyanogenic glycosides, may have higher selenium requirements, presumably because cyanide is released from the aglycone by glucosidase activity in the rumen and glutathione peroxidases is deactivated by the cyanide acting on the glutathione moiety. Neonate ruminants at risk of white muscle disease may be administered both selenium and vitamin E by injection; some of the WMD myopathies respond only to selenium, some only to vitamin E, and some to either. A number of correlative epidemiological studies have implicated selenium deficiency (measured by blood levels) in a number of serious or chronic diseases, such as cancer, diabetes, HIV/AIDS, and tuberculosis. In addition, selenium supplementation has been found to be a chemopreventive for some types of cancer in some types of rodents. One study of 118 exocrine pancreatic cancer (EPC) patients and 399 hospital controls in eastern Spain found high selenium concentrations to be inversely associated with the risk of EPC. In randomized, blinded, controlled prospective trials in humans, selenium supplementation has not succeeded in reducing the incidence of any disease, nor has a meta-analysis of such selenium supplementation studies detected a decrease in overall mortality. ^ a b Ruyle, George. "Poisonous Plants on Arizona Rangelands" (PDF). The University of Arizona. Archived from the original (PDF) on 2004-07-15. Retrieved 2009-01-05. ^ a b c d e f g h House, James E. (2008). Inorganic chemistry. Academic Press. p. 524. ISBN 978-0-12-356786-4. ^ a b c Greenwood, Norman N.; Earnshaw, Alan (1997). Chemistry of the Elements (2nd ed.). Butterworth-Heinemann. pp. 751–752. ISBN 978-0-08-037941-8. ^ Jafar, Mousa M. Abdul-Gader; Saleh, Mahmoud H.; Ahmad, Mais Jamil A.; Bulos, Basim N.; Al-Daraghmeh, Tariq M. (2016-04-01). "Retrieval of optical constants of undoped amorphous selenium films from an analysis of their normal-incidence transmittance spectra using numeric PUMA method". Journal of Materials Science: Materials in Electronics. 27 (4): 3281–3291. doi:10.1007/s10854-015-4156-z. ISSN 0957-4522. ^ Saleh, Mahmoud H.; Ershaidat, Nidal M.; Ahmad, Mais Jamil A.; Bulos, Basim N.; Jafar, Mousa M. Abdul-Gader (2017-06-01). "Evaluation of spectral dispersion of optical constants of a-Se films from their normal-incidence transmittance spectra using Swanepoel algebraic envelope approach". Optical Review. 24 (3): 260–277. Bibcode:2017OptRv..24..260S. doi:10.1007/s10043-017-0311-5. ISSN 1340-6000. ^ Minkov, D.A. ; Gavrilov, G.M. ; Angelov, G.V. ; Moreno, J.M.D. ; Vazquez, C.G. ; Ruano, S.M.F. ; Marquez, E. (2018). "Optimisation of the envelope method for characterisation of optical thin film on substrate specimens from their normal incidence transmittance spectrum". Thin Solid Films. 645: 370–378. Bibcode:2018TSF...645..370M. doi:10.1016/j.tsf.2017.11.003. ^ "The half-life of 79Se". Physikalisch-Technische Bundesanstalt. 2010-09-23. Retrieved 2012-05-29. ^ Jörg, Gerhard; Bühnemann, Rolf; Hollas, Simon; et al. (2010). "Preparation of radiochemically pure 79Se and highly precise determination of its half-life". Applied Radiation and Isotopes. 68 (12): 2339–2351. doi:10.1016/j.apradiso.2010.05.006. PMID 20627600. ^ 82Se is stable, for all practical purposes. ^ a b c Wiberg, Egon; Wiberg, Nils; Holleman, Arnold Frederick (2001). Inorganic chemistry. San Diego: Academic Press. p. 583. ISBN 978-0-12-352651-9. ^ Greenwood, Norman N.; Earnshaw, Alan (1997). Chemistry of the Elements (2nd ed.). Butterworth-Heinemann. p. 780. ISBN 978-0-08-037941-8. ^ Seppelt, K.; Desmarteau, Darryl D. (1980). Selenoyl difluoride. Inorganic Syntheses. 20. pp. 36–38. doi:10.1002/9780470132517.ch9. ISBN 978-0-471-07715-2. The report describes the synthesis of selenic acid. ^ Lenher, V. (April 1902). "Action of selenic acid on gold". Journal of the American Chemical Society. 24 (4): 354–355. doi:10.1021/ja02018a005. ^ Xu, Zhengtao (2007). Devillanova, Francesco A. (ed.). Handbook of chalcogen chemistry: new perspectives in sulfur, selenium and tellurium. Royal Society of Chemistry. p. 460. ISBN 978-0-85404-366-8. ^ Proctor, Nick H.; Hathaway, Gloria J. (2004). James P. Hughes (ed.). Proctor and Hughes' chemical hazards of the workplace (5th ed.). Wiley-IEEE. p. 625. ISBN 978-0-471-26883-3. ^ Woollins, Derek; Kelly, Paul F. (1993). "The Reactivity of Se4N4 in Liquid Ammonia". Polyhedron. 12 (10): 1129–1133. doi:10.1016/S0277-5387(00)88201-7. 2)". Dalton Transactions (4): 559–562. doi:10.1039/a606311j. ^ Siivari, Jari; Chivers, Tristram; Laitinen, Risto S. (1993). "A simple, efficient synthesis of tetraselenium tetranitride". Inorganic Chemistry. 32 (8): 1519–1520. doi:10.1021/ic00060a031. ^ Erker, G.; Hock, R.; Krüger, C.; Werner, S.; Klärner, F. G.; Artschwager-Perl, U. (1990). "Synthesis and Cycloadditions of Monomeric Selenobenzophenone". Angewandte Chemie International Edition in English. 29 (9): 1067–1068. doi:10.1002/anie.199010671. ^ Weeks, Mary Elvira (1932). "The discovery of the elements. VI. Tellurium and selenium". Journal of Chemical Education. 9 (3): 474. Bibcode:1932JChEd...9..474W. doi:10.1021/ed009p474. Smith, Willoughby (20 February 1873). "Effect of light on selenium during the passage of an electric current". Nature. 7 (173): 303. Bibcode:1873Natur...7R.303.. doi:10.1038/007303e0. ^ Bonnier Corporation (1876). "Action of light on selenium". Popular Science. 10 (1): 116. ^ Levinshtein, M. E.; Simin, G. S. (1992-12-01). Earliest semiconductor device. Getting to Know Semiconductors. pp. 77–79. ISBN 978-981-02-3516-1. ^ Winston, Brian (1998-05-29). Media Technology and Society: A History: From the Telegraph to the Internet. p. 89. ISBN 978-0-415-14229-8. ^ Morris, Peter Robin (1990). A History of the World Semiconductor Industry. p. 18. ISBN 978-0-86341-227-1. ^ Bergmann, Ludwig (1931). "Über eine neue Selen-Sperrschicht-Photozelle". Physikalische Zeitschrift. 32: 286–288. ^ Waitkins, G. R.; Bearse, A. E.; Shutt, R. (1942). "Industrial Utilization of Selenium and Tellurium". Industrial & Engineering Chemistry. 34 (8): 899–910. doi:10.1021/ie50392a002. ^ Pinsent, Jane (1954). "The need for selenite and molybdate in the formation of formic dehydrogenase by members of the Coli-aerogenes group of bacteria". Biochem. J. 57 (1): 10–16. doi:10.1042/bj0570010. PMC 1269698. PMID 13159942. ^ Stadtman, Thressa C. (2002). "Some Functions of the Essential Trace Element, Selenium". Trace Elements in Man and Animals 10. Trace Elements in Man and Animals 10. pp. 831–836. doi:10.1007/0-306-47466-2_267. ISBN 978-0-306-46378-5. ^ Schwarz, Klaus; Foltz, Calvin M. (1957). "Selenium as an Integral Part of Factor 3 Against Dietary Necrotic Liver Degeneration". Journal of the American Chemical Society. 79 (12): 3292–3293. doi:10.1021/ja01569a087. ^ Oldfield, James E. (2006). "Selenium: A historical perspective". Selenium. Selenium. pp. 1–6. doi:10.1007/0-387-33827-6_1. ISBN 978-0-387-33826-2. ^ Hatfield, D. L.; Gladyshev, V. N. (2002). "How Selenium Has Altered Our Understanding of the Genetic Code". Molecular and Cellular Biology. 22 (11): 3565–3576. doi:10.1128/MCB.22.11.3565-3576.2002. PMC 133838. PMID 11997494. ^ "Native Selenium". Webminerals. Retrieved 2009-06-06. ^ a b Kabata-Pendias, A. (1998). "Geochemistry of selenium". Journal of Environmental Pathology, Toxicology and Oncology. 17 (3–4): 173–177. PMID 9726787. ^ a b Fordyce, Fiona (2007). "Selenium Geochemistry and Health". AMBIO: A Journal of the Human Environment. 36: 94–97. doi:10.1579/0044-7447(2007)36[94:SGAH]2.0.CO;2. ^ Wessjohann, Ludger A.; Schneider, Alex; Abbas, Muhammad; Brandt, Wolfgang (2007). "Selenium in chemistry and biochemistry in comparison to sulfur". Biological Chemistry. 388 (10): 997–1006. doi:10.1515/BC.2007.138. PMID 17937613. ^ Birringer, Marc; Pilawa, Sandra; Flohé, Leopold (2002). "Trends in selenium biochemistry". Natural Product Reports. 19 (6): 693–718. doi:10.1039/B205802M. PMID 12521265. ^ Amouroux, David; Liss, Peter S.; Tessier, Emmanuel; et al. (2001). "Role of oceans as biogenic sources of selenium". Earth and Planetary Science Letters. 189 (3–4): 277–283. Bibcode:2001E&PSL.189..277A. doi:10.1016/S0012-821X(01)00370-3. ^ Haug, Anna; Graham, Robin D.; Christophersen, Olav A.; Lyons, Graham H. (2007). "How to use the world's scarce selenium resources efficiently to increase the selenium concentration in food". Microbial Ecology in Health and Disease. 19 (4): 209–228. doi:10.1080/08910600701698986. PMC 2556185. PMID 18833333. ^ "Public Health Statement: Selenium" (PDF). Agency for Toxic Substances and Disease Registry. Retrieved 2009-01-05. ^ "Public Health Statement: Selenium – Production, Import/Export, Use, and Disposal" (PDF). Agency for Toxic Substances and Disease Registry. Retrieved 2009-01-05. ^ "Chemistry: Periodic Table: selenium: key information". webelements. Retrieved 2009-01-06. ^ Bartos, P. J. (2002). "SX-EW copper and the technology cycle". Resources Policy. 28 (3–4): 85–94. doi:10.1016/S0301-4207(03)00025-4. ^ a b Naumov, A. V. (2010). "Selenium and tellurium: State of the markets, the crisis, and its consequences". Metallurgist. 54 (3–4): 197–200. doi:10.1007/s11015-010-9280-7. ^ Hoffmann, James E. (1989). "Recovering selenium and tellurium from copper refinery slimes". JOM. 41 (7): 33–38. Bibcode:1989JOM....41g..33H. doi:10.1007/BF03220269. ^ Hyvärinen, Olli; Lindroos, Leo; Yllö, Erkki (1989). "Recovering selenium from copper refinery slimes". JOM. 41 (7): 42–43. Bibcode:1989JOM....41g..42H. doi:10.1007/BF03220271. ^ a b c "Selenium and Tellurium: Statistics and Information". United States Geological Survey. Retrieved 2012-05-30. ^ Sun, Yan; Tian, Xike; He, Binbin; et al. (2011). "Studies of the reduction mechanism of selenium dioxide and its impact on the microstructure of manganese electrodeposit". Electrochimica Acta. 56 (24): 8305–8310. doi:10.1016/j.electacta.2011.06.111. ^ Bernd E. Langner "Selenium and Selenium Compounds" in Ullmann's Encyclopedia of Industrial Chemistry, 2005, Wiley-VCH, Weinheim. doi:10.1002/14356007.a23_525. ^ Davis, Joseph R. (2001). Copper and Copper Alloys. ASM Int. p. 91. ISBN 978-0-87170-726-0. ^ Isakov, Edmund (2008-10-31). Cutting Data for Turning of Steel. p. 67. ISBN 978-0-8311-3314-6. ^ Gol'Dshtein, Ya. E.; Mushtakova, T. L.; Komissarova, T. A. (1979). "Effect of selenium on the structure and properties of structural steel". Metal Science and Heat Treatment. 21 (10): 741–746. Bibcode:1979MSHT...21..741G. doi:10.1007/BF00708374. ^ Davis, Joseph R. (2001). Copper and Copper Alloys. ASM International. p. 278. ISBN 978-0-87170-726-0. ^ Eftekhari, Ali (2017). "The rise of lithium–selenium batteries". Sustainable Energy & Fuels. 1: 14–29. doi:10.1039/C6SE00094K. ^ Deutsche Gesellschaft für Sonnenenergie (2008). "Copper indium diselenide (CIS) cell". Planning and Installing Photovoltaic Systems: A Guide for Installers, Architects and Engineers. Earthscan. pp. 43–44. ISBN 978-1-84407-442-6. ^ Wee Chong Tan (July 2006). Optical Properties of Amorphous Selenium Films (PDF) (Master of Science thesis). University of Saskatchewan. ^ Springett, B. E. (1988). "Application of Selenium-Tellurium Photoconductors to the Xerographic Copying and Printing Processes". Phosphorus and Sulfur and the Related Elements. 38 (3–4): 341–350. doi:10.1080/03086648808079729. ^ Williams, Rob (2006). Computer Systems Architecture: A Networking Approach. Prentice Hall. pp. 547–548. ISBN 978-0-321-34079-5. ^ Diels, Jean-Claude; Arissian, Ladan (2011). "The Laser Printer". Lasers. Wiley-VCH. pp. 81–83. ISBN 978-3-527-64005-8. ^ Meller, Gregor & Grasser, Tibor (2009). Organic Electronics. Springer. pp. 3–5. ISBN 978-3-642-04537-0. ^ Normile, Dennis (2000). "The birth of the Blues". Popular Science. p. 57. ^ Kasap, Safa; Frey, Joel B.; Belev, George; et al. (2009). "Amorphous selenium and its alloys from early xeroradiography to high resolution X-ray image detectors and ultrasensitive imaging tubes". Physica Status Solidi B. 246 (8): 1794–1805. Bibcode:2009PSSBR.246.1794K. doi:10.1002/pssb.200982007. ^ Svelto, Orazio (1998). Principles of LASERs fourth ed. Plenum. p. 457. ISBN 978-0-306-45748-7. ^ Hai-Fu, F.; Woolfson, M. M.; Jia-Xing, Y. (1993). "New Techniques of Applying Multi-Wavelength Anomalous Scattering Data". Proceedings of the Royal Society A: Mathematical, Physical and Engineering Sciences. 442 (1914): 13–32. Bibcode:1993RSPSA.442...13H. doi:10.1098/rspa.1993.0087. ^ MacLean, Marion E. (1937). "A project for general chemistry students: Color toning of photographic prints". Journal of Chemical Education. 14 (1): 31. Bibcode:1937JChEd..14...31M. doi:10.1021/ed014p31. ^ Penichon, Sylvie (1999). "Differences in Image Tonality Produced by Different Toning Protocols for Matte Collodion Photographs". Journal of the American Institute for Conservation. 38 (2): 124–143. doi:10.2307/3180042. JSTOR 3180042. ^ McKenzie, Joy (2003). Exploring Basic Black & White Photography. Delmar. p. 176. ISBN 978-1-4018-1556-1. ^ Hayward, Peter; Currie, Dean. "Radiography of Welds Using Selenium 75, Ir 192 and X-rays" (PDF). ^ "Selenium". Linus Pauling Institute at Oregon State University. Retrieved 2009-01-05. ^ Mazokopakis, E. E.; Papadakis, J. A.; Papadomanolaki, M. G.; et al. (2007). "Effects of 12 months treatment with L-selenomethionine on serum anti-TPO Levels in Patients with Hashimoto's thyroiditis". Thyroid. 17 (7): 609–612. doi:10.1089/thy.2007.0040. PMID 17696828. ^ Ralston, N. V.; Ralston, C. R.; Blackwell, JL III; Raymond, L. J. (2008). 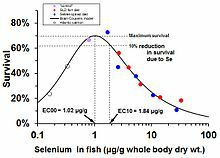 "Dietary and tissue selenium in relation to methylmercury toxicity" (PDF). Neurotoxicology. 29 (5): 802–811. CiteSeerX 10.1.1.549.3878. doi:10.1016/j.neuro.2008.07.007. PMID 18761370. ^ Penglase, S.; Hamre, K.; Ellingsen, S. (2014). "Selenium prevents downregulation of antioxidant selenoprotein genes by methylmercury". Free Radical Biology and Medicine. 75: 95–104. doi:10.1016/j.freeradbiomed.2014.07.019. PMID 25064324. ^ Usuki, F.; Yamashita, A.; Fujimura, M. (2011). "Post-transcriptional defects of antioxidant selenoenzymes cause oxidative stress under methylmercury exposure". The Journal of Biological Chemistry. 286 (8): 6641–6649. doi:10.1074/jbc.M110.168872. PMC 3057802. PMID 21106535. ^ Ohi, G.; Seki, H.; Maeda, H.; Yagyu, H. (1975). "Protective effect of selenite against methylmercury toxicity: observations concerning time, dose and route factors in the development of selenium attenuation". Industrial Health. 13 (3): 93–99. doi:10.2486/indhealth.13.93. ^ Ralston, NVC; Raymond, L. J. (2010). "Dietary selenium's protective effects against methylmercury toxicity". Toxicology. 278 (1): 112–123. doi:10.1016/j.tox.2010.06.004. PMID 20561558. ^ Carvalho, CML; Chew, Hashemy SI; Hashemy, J.; et al. (2008). "Inhibition of the human thioredoxin system: A molecular mechanism of mercury toxicity". Journal of Biological Chemistry. 283 (18): 11913–11923. doi:10.1074/jbc.M710133200. PMID 18321861. ^ Yamashita, Y; Yabu, T; Yamashita, M (2010). "Discovery of the strong antioxidant selenoneine in tuna and selenium redox metabolism". World J Biol Chem. 1 (5): 144–50. doi:10.4331/wjbc.v1.i5.144. PMC 3083957. PMID 21540999. ^ a b Gladyshev, Vadim N.; Hatfield, Dolph L. (1999). "Selenocysteine-containing proteins in mammals" (Submitted manuscript). Journal of Biomedical Science. 6 (3): 151–160. doi:10.1007/BF02255899. PMID 10343164. ^ Stadtman, T. C. (1996). "Selenocysteine". Annual Review of Biochemistry. 65: 83–100. doi:10.1146/annurev.bi.65.070196.000503. PMID 8811175. ^ Lobanov, Alexey V.; Fomenko, Dmitri E.; Zhang, Yan; et al. (2007). "Evolutionary dynamics of eukaryotic selenoproteomes: large selenoproteomes may associate with aquatic life and small with terrestrial life". Genome Biology. 8 (9): R198. doi:10.1186/gb-2007-8-9-r198. PMC 2375036. PMID 17880704. ^ Castellano, Sergi; Novoselov, Sergey V.; Kryukov, Gregory V.; et al. (2004). "Reconsidering the evolution of eukaryotic selenoproteins: a novel nonmammalian family with scattered phylogenetic distribution". EMBO Reports. 5 (1): 71–7. doi:10.1038/sj.embor.7400036. PMC 1298953. PMID 14710190. ^ Kryukov, Gregory V.; Gladyshev, Vadim N. (2004). "The prokaryotic selenoproteome". EMBO Reports. 5 (5): 538–43. doi:10.1038/sj.embor.7400126. PMC 1299047. PMID 15105824. ^ Wilting, R.; Schorling, S.; Persson, B. C.; Böck, A. (1997). "Selenoprotein synthesis in archaea: identification of an mRNA element of Methanococcus jannaschii probably directing selenocysteine insertion". Journal of Molecular Biology. 266 (4): 637–41. doi:10.1006/jmbi.1996.0812. PMID 9102456. ^ Zhang, Yan; Fomenko, Dmitri E.; Gladyshev, Vadim N. (2005). "The microbial selenoproteome of the Sargasso Sea". Genome Biology. 6 (4): R37. doi:10.1186/gb-2005-6-4-r37. PMC 1088965. PMID 15833124. ^ Barclay, Margaret N. I.; MacPherson, Allan; Dixon, James (1995). "Selenium content of a range of UK food". Journal of Food Composition and Analysis. 8 (4): 307–318. doi:10.1006/jfca.1995.1025. ^ A list of selenium-rich foods can be found on The Office of Dietary Supplements Selenium Fact Sheet. ^ "FDA Issues Final Rule to Add Selenium to List of Required Nutrients for Infant Formula". www.fda.gov. Archived from the original on November 14, 2017. Retrieved September 10, 2015. ^ A common reference for this is Schroeder, H. A.; Frost, D. V.; Balassa, J. J. (1970). "Essential trace metals in man: Selenium". Journal of Chronic Diseases. 23 (4): 227–43. doi:10.1016/0021-9681(70)90003-2. OSTI 6424964. PMID 4926392. ^ Zane Davis, T. (2008-03-27). "Selenium in Plants" (PDF). p. 8. Retrieved 2008-12-05. ^ Baselt, R. (2008). Disposition of Toxic Drugs and Chemicals in Man (8th ed.). Foster City, CA: Biomedical Publications. pp. 1416–1420. ISBN 978-0-9626523-5-6. ^ "Dietary Supplement Fact Sheet: Selenium". National Institutes of Health; Office of Dietary Supplements. Retrieved 2009-01-05. ^ Yang, G.; Zhou, R. (1994). "Further Observations on the Human Maximum Safe Dietary Selenium Intake in a Seleniferous Area of China". Journal of Trace Elements and Electrolytes in Health and Disease. 8 (3–4): 159–165. PMID 7599506. ^ Yang, Guang-Qi; Xia, Yi-Ming (1995). "Studies on Human Dietary Requirements and Safe Range of Dietary Intakes of Selenium in China and Their Application in the Prevention of Related Endemic Diseases". Biomedical and Environmental Sciences. 8 (3): 187–201. PMID 8561918. ^ "Public Health Statement: Health Effects" (PDF). Agency for Toxic Substances and Disease Registry. Retrieved 2009-01-05. ^ Wilber, C. G. (1980). "Toxicology of selenium". Clinical Toxicology. 17 (2): 171–230. doi:10.3109/15563658008985076. PMID 6998645. ^ Olson, O. E. (1986). "Selenium Toxicity in Animals with Emphasis on Man". International Journal of Toxicology. 5: 45–70. doi:10.3109/10915818609140736. ^ "Polo pony selenium levels up to 20 times higher than normal". 2009-05-06. Retrieved 2009-05-05. ^ Lemly, D. (2004). "Aquatic selenium pollution is a global environmental safety issue". Ecotoxicology and Environmental Safety. 59 (1): 44–56. doi:10.1016/S0147-6513(03)00095-2. PMID 15261722. ^ Ohlendorf, H. M. (2003). Ecotoxicology of selenium. Handbook of ecotoxicology. Boca Raton: Lewis Publishers. pp. 466–491. ISBN 978-1-56670-546-2. ^ Lemly, A. D. (1997). "A teratogenic deformity index for evaluating impacts of selenium on fish populations". Ecotoxicology and Environmental Safety. 37 (3): 259–266. doi:10.1006/eesa.1997.1554. PMID 9378093. ^ Penglase, S.; Hamre, K.; Ellingsen, S. (2014). "Selenium and mercury have a synergistic negative effect on fish reproduction". Aquatic Toxicology. 149: 16–24. doi:10.1016/j.aquatox.2014.01.020. PMID 24555955. ^ Heinz, G. H.; Hoffman, D. J. (1998). "Methylmercury chloride and selenomethionine interactions on health and reproduction in mallards". Environmental Toxicology and Chemistry. 17 (2): 139–145. doi:10.1002/etc.5620170202. ^ a b Hamilton, Steven J.; Buhl, Kevin J.; Faerber, Neil L.; et al. (1990). "Toxicity of organic selenium in the diet to chinook salmon". Environ. Toxicol. Chem. 9 (3): 347–358. doi:10.1002/etc.5620090310. ^ a b Poston, H. A.; Combs Jr., G. F.; Leibovitz, L. (1976). "Vitamin E and selenium interrelations in the diet of Atlantic salmon (Salmo salar): gross, histological and biochemical signs". Journal of Nutrition. 106 (7): 892–904. doi:10.1093/jn/106.7.892. PMID 932827. ^ Brain, P.; Cousens, R. (1989). "Weed Research". Weed Research. 29 (2): 93–96. doi:10.1111/j.1365-3180.1989.tb00845.x. ^ "CDC - NIOSH Pocket Guide to Chemical Hazards - Selenium". www.cdc.gov. Retrieved 2015-11-21. ^ Ravaglia, G.; Forti, P.; Maioli, F.; et al. (2000). "Effect of micronutrient status on natural killer cell immune function in healthy free-living subjects aged ≥90 y". American Journal of Clinical Nutrition. 71 (2): 590–598. doi:10.1093/ajcn/71.2.590. PMID 10648276. ^ MedSafe Editorial Team. "Selenium". Prescriber Update Articles. New Zealand Medicines and Medical Devices Safety Authority. Retrieved 2009-07-13. ^ Ralston, N. V. C.; Raymond, L. J. (2010). "Dietary selenium's protective effects against methylmercury toxicity". Toxicology. 278 (1): 112–123. doi:10.1016/j.tox.2010.06.004. PMID 20561558. ^ Mann, Jim; Truswell, A. Stewart (2002). Essentials of Human Nutrition (2nd ed.). Oxford University Press. ISBN 978-0-19-262756-8. ^ Moreno-Reyes, R.; Mathieu, F.; Boelaert, M.; et al. (2003). "Selenium and iodine supplementation of rural Tibetan children affected by Kashin-Beck osteoarthropathy". American Journal of Clinical Nutrition. 78 (1): 137–144. doi:10.1093/ajcn/78.1.137. PMID 12816783. ^ Kachuee, R.; Moeini, M.; Suori, M. (2013). "The effect of dietary organic and inorganic selenium supplementation on serum Se, Cu, Fe and Zn status during the late pregnancy in Merghoz goats and their kids". Small Ruminant Research. 110 (1): 20–27. doi:10.1016/j.smallrumres.2012.08.010. ^ National Research Council, Subcommittee on Sheep Nutrition (1985). Nutrient requirements of sheep. 6th ed., National Academy Press, Washington, ISBN 0309035961. ^ a b National Research Council, Committee on Nutrient Requirements of Small Ruminants (2007). Nutrient requirements of small ruminants. National Academies Press, Washington, ISBN 0-309-10213-8. ^ Coop, I. E.; Blakely, R. L. (1949). "The metabolism and toxicity of cyanides and cyanogenic glycosides in sheep". N. Z. J. Sci. Technol. 30: 277–291. ^ Kraus, R. J.; Prohaska, J. R.; Ganther, H. E. (1980). "Oxidized forms of ovine erythrocyte glutathione peroxidase. Cyanide inhibition of 4-glutathione:4-selenoenzyme". Biochim. Biophys. Acta. 615 (1): 19–26. doi:10.1016/0005-2744(80)90004-2. PMID 7426660. ^ Kahn, C. M. (ed.) (2005). Merck veterinary manual. 9th ed. Merck & Co., Inc., Whitehouse Station, ISBN 0911910506. ^ a b Ip, C. (1998). "Lessons from basic research in selenium and cancer prevention" (PDF). The Journal of Nutrition. 128 (11): 1845–54. doi:10.1093/jn/128.11.1845. PMID 9808633. ^ Amaral, A. F. S.; Cantor, K. P.; Silverman, D. T.; Malats, N. (31 August 2010). "Selenium and Bladder Cancer Risk: a Meta-analysis". Cancer Epidemiology, Biomarkers & Prevention. 19 (9): 2407–2415. doi:10.1158/1055-9965.EPI-10-0544. PMID 20807831. ^ Rayman, Margaret P. (2000). "The importance of selenium to human health". The Lancet. 356 (9225): 233–41. doi:10.1016/S0140-6736(00)02490-9. PMID 10963212. ^ Amaral, A.F.S. ; Porta, M.; Silverman, D.T. ; et al. (2012). "Pancreatic cancer risk and levels of trace elements". Gut. 61 (11): 1583–1588. doi:10.1136/gutjnl-2011-301086. PMC 3310963. PMID 22184070. ^ Bjelakovic, G.; Nikolova, D.; Gluud, L. L.; et al. (2012). Bjelakovic, Goran (ed.). "Antioxidant supplements for prevention of mortality in healthy participants and patients with various diseases" (Submitted manuscript). Cochrane Database of Systematic Reviews. 3 (3): CD007176. doi:10.1002/14651858.CD007176.pub2. PMID 22419320.